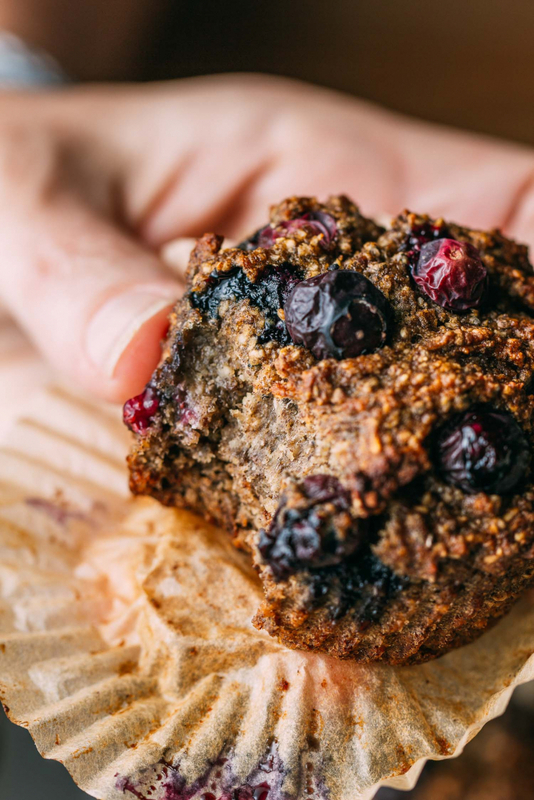 If these Banana Blueberry Chia Seed Muffins could speak, they’d have nothing but good things to say! They’d say nice things because that’s what they’re made of, natural, good-for-you, ingredients that taste as fresh as they sound. 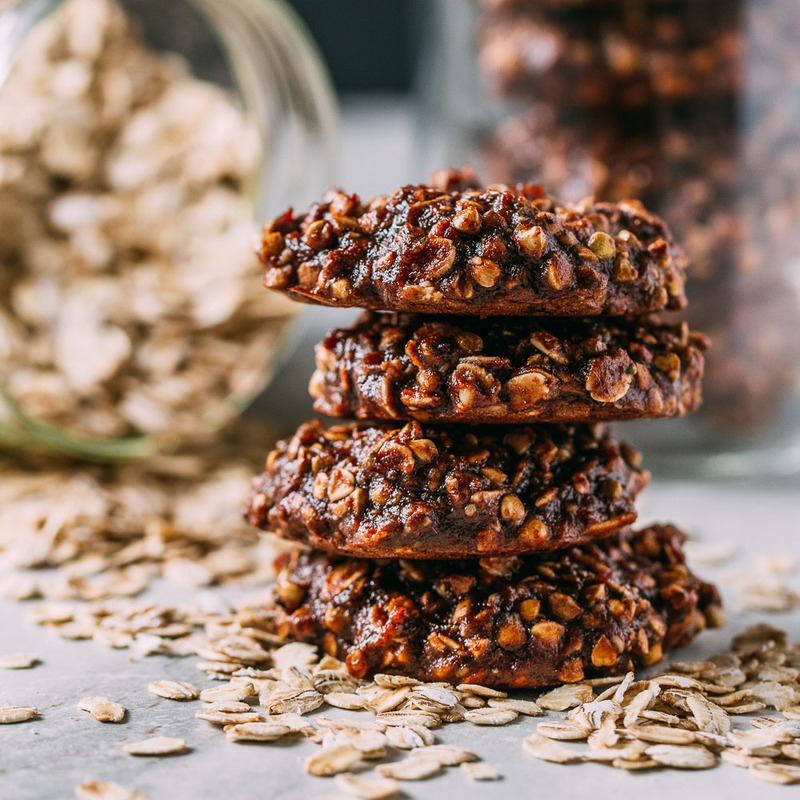 Here, lemon juice, dates, flax, and naturally gluten-free oat flour join the fruit and chia to create the perfect parchment-wrapped bite! And the best part is that these plant-based, nut-free, blueberry cuties aren’t just healthy, they’re also delicious! So, a funny thing happened on the way to this recipe; a grocery store advertisement inspired us. When we noticed that fresh, organic, blueberries were on sale we started writing a list of what tastes good with them. Once our list of ingredients was complete, we knew we should feature our blueberries in a batch of vegan muffins. Tartness and tang usually pair well with the sweetness of blueberries. So lemon was the first ingredient to make it on the list. Next, it was the chia seeds. Chia seeds, when left whole, are kind of fun texture, and we use them often to add body and crunch to our gluten-free baked goods. We’ve read multiple claims citing both the benefits and the argument that chia is not quite everything that some suggest. But we enjoy chia seeds, and so we like to include them! 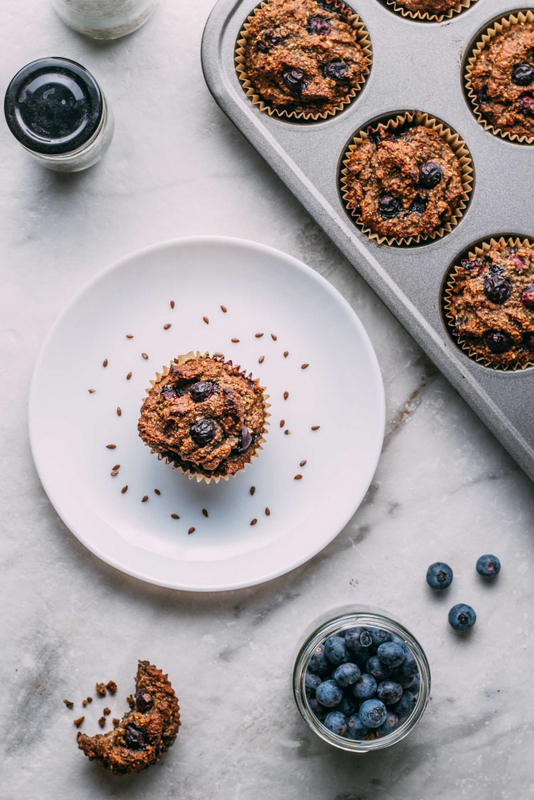 Chia brings an element of whimsy to these Banana Blueberry Chia Seed Muffins. So bottom line, we believe that this recipe benefits from the inclusion of the lovely little blackish-gray cha-cha-cha chia seeds. So included, they are! 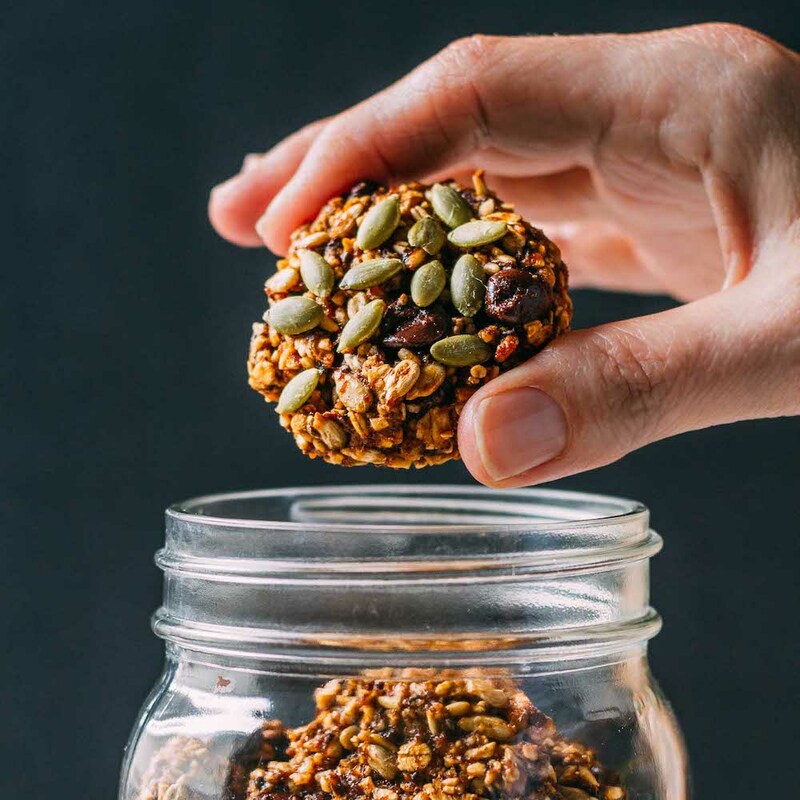 Next came the freshly ground flax seeds because, well, they’re flax seeds and besides the omega 3’s they provide, they keep things moving if you know what we’re saying. So, flax was a high priority. We use an inexpensive grinder to grind just the amount that we need in a recipe. We use this same grinder for our spices too. 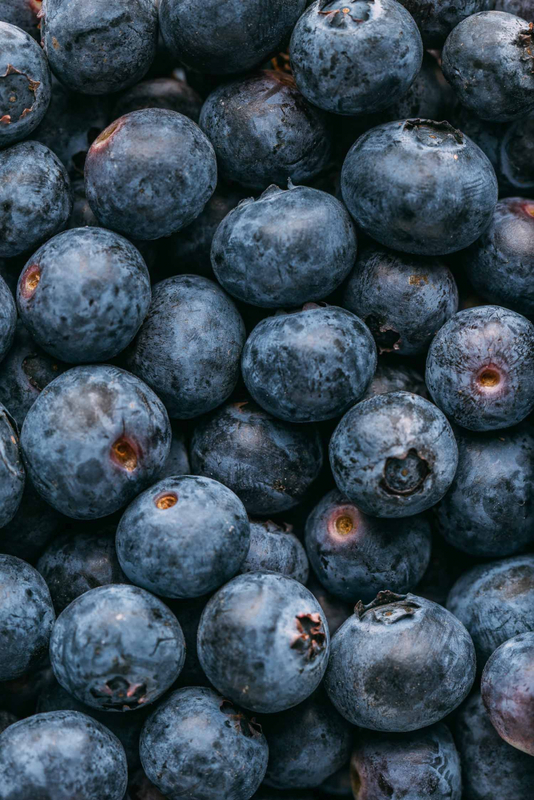 For sweetness, we thought about what we like to eat alongside blueberries. One of the first things that came to mind was bananas. There’s nothing quite as easy to add a little natural unrefined sweetness to a recipe than a well-ripened banana. To take the sweet to a whole other level while adding even more nutrients, we went straight to Medjool dates. To read about some health benefits of Medjool dates, you might want to check out this article. Quality Medjool dates do tend to be somewhat on the pricier side of life in date-land. So we recommend buying in bulk to get the best quality for the least cost. Buying in bulk is a practice we often use. Bulk buying saves time shopping, reduces cost, helps us afford the best quality, and even cuts down on the packaging to reduce waste. So when we mention dates in a recipe, you can bet that we are using the dates we mention in the ingredient list below. And finally, we want to make mention of Medical Medium, Anthony Williams as one of his muffin recipes inspired us as we created this one. We often renew our determination to reduce refined sugar and oils and other unhealthy ingredients and such as much as possible by reading his recipes and suggestions. And the same is true of Forks Over Knives. Forks Over Knives is a constant source of encouragement for us as they lead the way in making plant-based vegan living a more popular and attractive alternative. If you’ve never visited their website or Facebook group, you should. On that note, someone very dear recently asked how they could help us grow this blog to reach more people and share this wonderfully delicious way of eating. So, in answer to that, whenever you have the chance, kindly share our recipes. Share them on the social media platforms you enjoy and frequent the most. Share our recipes with recipe loving friends, family, cooking clubs, and Facebook groups. And certainly, feel free to Pin our recipes on Pinterest after you read or try them. When you share our recipes, you help strengthen the message that plant-based vegan eating equals tasty, easy to make, and easy to love, food. One dozen muffins and a partridge in a pear tree! And even though we’re sharing this delicious recipe in the middle of March, that’s what kept running through our thoughts as we filled the twelfth little parchment liner. And we might have even sung a little bit, too, maybe. 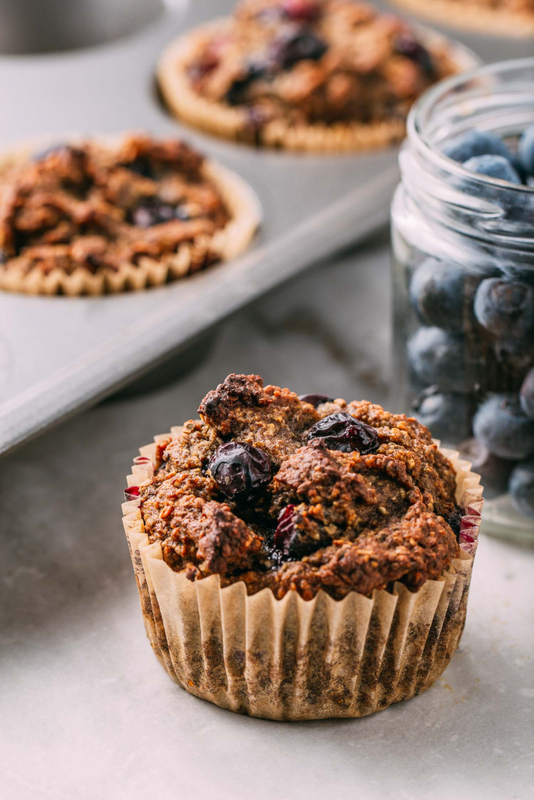 These naturally gluten-free, blueberry muffins are everything they should be and nothing that they shouldn’t. They’re moist, lite, slightly sweet, very berry-full, a little tart and incredibly tender, thanks to all of the beautiful plant-based, vegan, ingredients! We’re saying that one serving equals one muffin but let’s be honest, how you do the math is entirely up to you. 6-pitted Medjool dates - We prefer to purchase our organic Medjool dates from this brand in bulk to save money. 1/4 -1/2 tsp of pink Himalayan salt, or another salt - We use just about 1/2 teaspoon of salt. 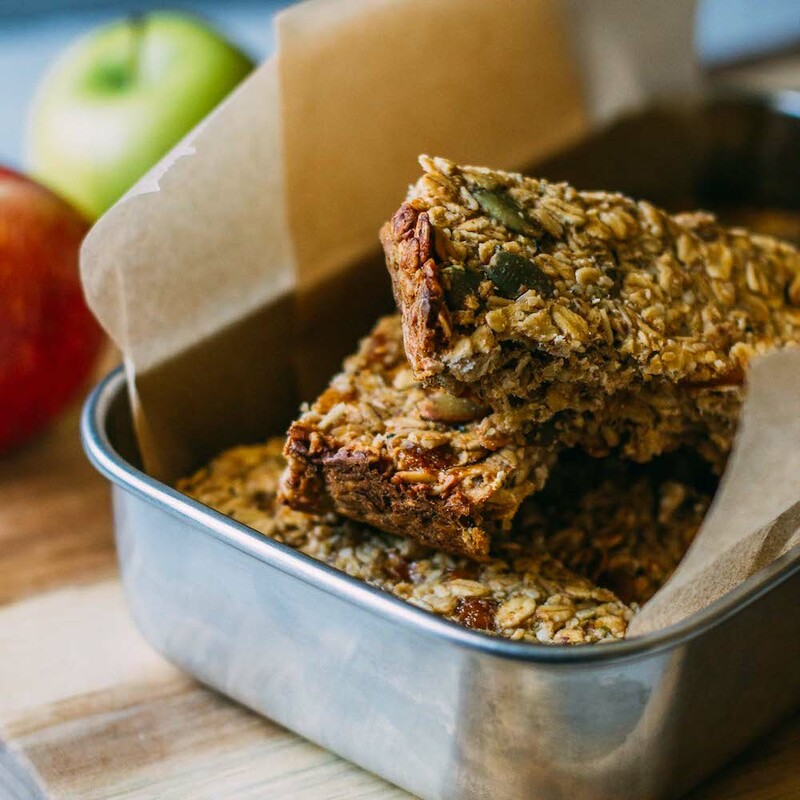 1 cup of oat flour - Make your oat flour using regular or gluten-free oats as needed. 1/2 cup of almond flour or another nut flour - For nut-free muffins, sub the almond flour with another 1/2 cup of oat flour. 1 tbsp of whole flax seed, ground or use flaxseed meal - Use a small spice grinder to grind whole flax seeds yourself to gain more nutrients from the flax. Preheat your oven to 375º Fahrenheit and line a muffin tin with nonstick parchment paper liners. If you're making your oat flour from old fashioned oatmeal that you mill or grind yourself, go ahead and grind the oats in a food processor and then place your oat flour in a large mixing bowl. By making the oat flour first, you skip the step of having to clean out the processor from the residue of wet ingredients to grind it later. In a food processor or high-speed blender, combine the first five ingredients, stopping to scrape down the sides as needed. Give this a taste to check that the salt is right and honestly, just to taste it - it's so good! Next, add the remaining dry ingredients to the oat flour that's already in the large mixing bowl. Give the dry ingredients a quick stir and then stir the blended wet ingredients that you just tasted into the dry mix. Stir just until combined and then gently fold in the blueberries. Now fill each parchment lined muffin tin about 3/4 of the way full and bake for about 25-30 minutes or so. Allow cooling for just a moment or two in the tin and then carefully move the muffins to a cooling rack. Leaving baked goods in a baking tin to cool completely may create soggy bottoms, and nobody ever wants that. 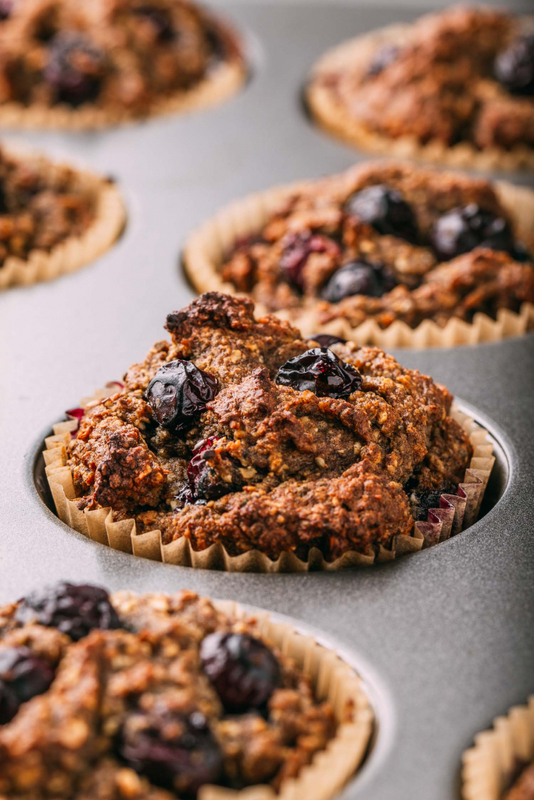 Enjoy your muffins warm from the oven, or you may store them in a sealed container in the refrigerator for a few days or freeze to keep for a much longer length of time. While we like to grind half of our chia seeds to ensure we gain all of the nutrients they offer we prefer to leave half of the chia seeds whole for texture. To grind or not to grind your chia may come down to a preference thing, so treat your chia how according to your liking. 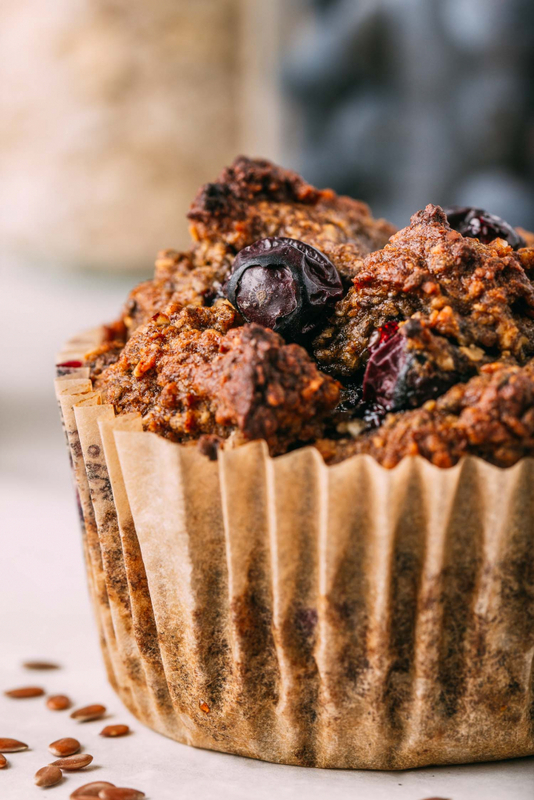 If you prefer a sweeter muffin, you could add a tablespoon or two of maple syrup or another sweetener of choice. But although we offer this alternative as a suggestion, we recommend following the recipe as it's written for optimal results. Your website, pictures and recipes all look AMAZING. These gorgeous muffins got my attention immediately. 3 very ripe bananas on my counter, thawed wild blueberries in the fridge and an addiction to lemon and ACV sealed the deal. They are in the oven right now. Unfortunately, I had about one muffins worth of batter left over…took care of that immediately…OMGosh! I love that I didn’t have to worry about raw egg as I scraped my bowl clean. 😋😋 Thank you for your efforts for our pleasure. Buzzer going off…gotta run. 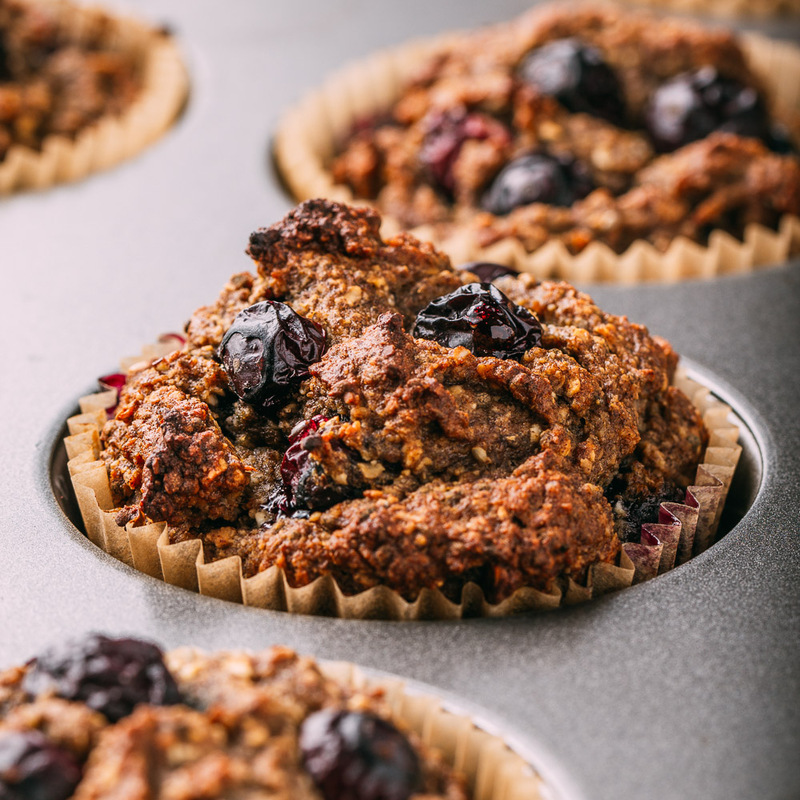 What a pleasure it is to read your play by play experience with our muffin recipe, Cindy! And we’re with you on that addiction to lemon juice and ACV. (We’re beginning to think that more lemon trees may be just the thing to achieve world peace.) Oh, and thank goodness you knew how to handle that bit of leftover batter, whew!